Elis Lloyd led the Quins out with his new son to mark his 200th game for the Quins, and a warm reception from the crowd. The Park was once again at its most magnificent best with the weather near perfect. With just two changes from the Neath victory, the players responded by winning the opening line out after the Swansea throw in, and the first set piece saw the Quins shunt the All White pack a full 10-yards setting the scene for the rest of the match. 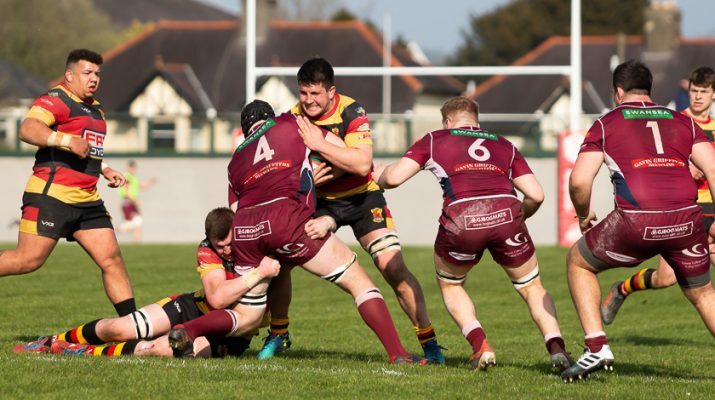 The conditions favoured open play and the players were in the same mood, so the early play was fast and furious, a 4th minute penalty was missed by Aled Thomas, but the Quins were able to keep most of the action in the Whites 22. Mid way through the half the Quins were camped on the Swansea line and amazingly after Five scrums and with the visitors in complete disarray the referee failed to award the obvious penalty try,but five penalties in close succession, to the dissatisfaction of the home support. It was embarrassing to all when he eventually gave one of the Swansea props a yellow card. It was after the fifth penalty in as many minutes that Skipper Haydn Pugh, that their play was not going to rewarded and elected to kick at Goal which was duly converted by Aled Thomas after 27 minutes. The Quins kept up their pressure and after a line out near the visitors line, Javan Sebastian was able to crash over for the long awaited try. Aled Thomas added the points. With the half into injury time Phil Jones end the first 40 with a penalty for Swansea. The Quins enthusiasm was marred with a series of dropped passes and chances were missed to make the game safe. This gave Phil Jones to pull another three points back with his second penalty. More Quins pressing kept play in the Swansea half and Aled Thomas was on hand to score his 700th point for the Quins with his second penalty. Phil Jones was on hand soon after with his third penalty, keeping Swansea in the game. After the hour mark, Aled Thomas put over his third penalty. With five minutes remaining Aled Thomas slotted his fourth penalty, and things looked good for the Quins leading 19-9. In the dying minutes of normal play the Swansea team were able to scramble into the Quins half and Callum Carson was credited with a try which was drop converted from the touchline by Jones with time running out for the All Whites, and this brought them to within a sniff of a win at 19-16 down. Indiscipline and wrong decisions by the Quins let Swansea back into the Quins half and then into the 22 and a move down the right saw Alex Jeffries going over at the corner flag and without hesitation the man with the whistle awarded a try in the 85th minute, the missed conversion was the last touch of the game and the Quins were denied the deserved victory that they had richly earned. This result keeps Swansea ahead of the Quins and 17 points clear from Llanelli RFC in 11th spot.With just two home games remaining, the Quins hope that their place in next seasons Premier is assured.